From the time of the Civil War to the present, Reform Congregation Keneseth Israel’s membership has distinguished itself by its commitment to military service. From the Civil War to Vietnam, 23 members of our synagogue have given their lives in the defense of the United States. A permanent military memorial board was installed in our Chapel during World War II and was then relocated to Elkins Park in the 1950s. 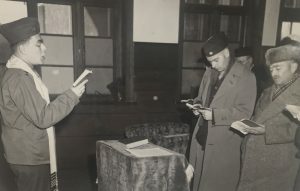 Several of our rabbis have also served as military chaplains including Rabbi Bertram Korn, the first American Jew to rise the rank of Admiral in the United States Navy. A past member served as the National Commander of the Jewish War Veterans. Currently, we have several religious school graduates serving as officers in the Navy and the Marines. The KI Archives includes primary materials on the lives of many of our service people.